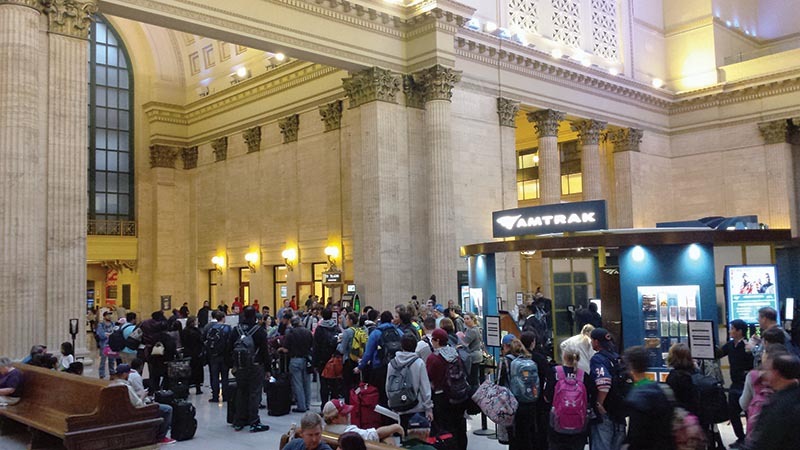 Chicago Union Station’s Great Hall now features an Amtrak customer service kiosk. Most long-distance trains are now boarded from this location, instead of the cramped waiting lounge on the other side of the station. I’ve never been a big fan of flying. While I don’t have nearly the same kind of crushing anxiety I used to about getting on a plane, it’s still not my favorite way to travel. I didn’t make my first flight until I was 22, but it took me only 18 years to board my first Amtrak train, despite growing up in an area saturated by frequent passenger schedules. While planes are great for quick hops across the country, I try to work train travel into my schedule whenever I can. Besides supporting the industry, I find it to be a much better travel option for trips of a certain duration. For instance, I travel to the Chicago area a couple times a year to attend the Center for Railroad Photography & Art’s annual “Conversations” each spring, and to work the booth at Trainfest in Milwaukee each fall. There are a number of flights that will get me there in about two hours, but that’s not counting arriving early at the airport for check-in and screening, the flight itself, and then the process of arriving at one of the nation’s busiest airport hubs, waiting for the rental car shuttle, and so on. Instead, I prefer the overnight journey on the Lake Shore Limited. The westbound train is scheduled to depart Rochester, N.Y., at 11:09 p.m., which means I can still get a full day of activity in, enjoy dinner, and make my way to the station at my leisure since I only live ten minutes from the downtown station. One of the joys of riding an overnight train is that someone else is taking care of the driving while you sleep. I’m a hearty soul that toughs it out in coach, and I’m usually passed out by the time we leave Buffalo. Sunrise greets the train west of Toledo, Ohio, and by the time we are pulling into Elkhart, Ind., I am enjoying breakfast in the dining car. After a morning arrival in Chicago, a brisk stroll brings me to the rental car desk to check in. A few minutes later, I’m in my car and on my way to my final destination. Not a bad way to go. Of course, this train is often derided as the “Late-For-Sure Limited” due to occasional delays encountered across both CSX and Norfolk Southern territory on its daily New York-to-Chicago run. In my experience, these delays increase during the spring and summer months, when both railroads are deep into their track maintenance and signal replacement programs. 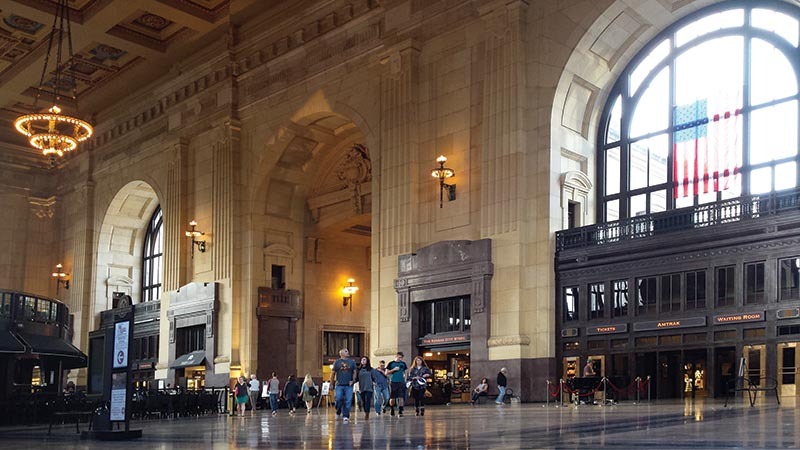 The Main Concourse at Kansas City Union Station is now a restored public space. You’ve probably seen some of my postings if you follow the Facebook fan pages for Railfan & Railroad or Passenger Train Journal. I like to share my experiences while riding, especially the unique aspects of the trip like enjoying a meal in the full-service dining cars. I really logged the mileage the past few months, with three visits to Chicago. After my April trip to attend the CRPA conference in Lake Forest, Ill., I scheduled an October visit to Kansas City, followed by a November run to Milwaukee with a return route via Lynchburg, Va. In mid-October, publisher Kevin EuDaly and his family hosted a fun get-together for the entire White River Productions staff in the company’s home town of Kansas City, Mo. Even better, the party was held in a special room inside historic Kansas City Union Station! Why fly and rent a car, when I could just ride the train and arrive at the party (more or less)? 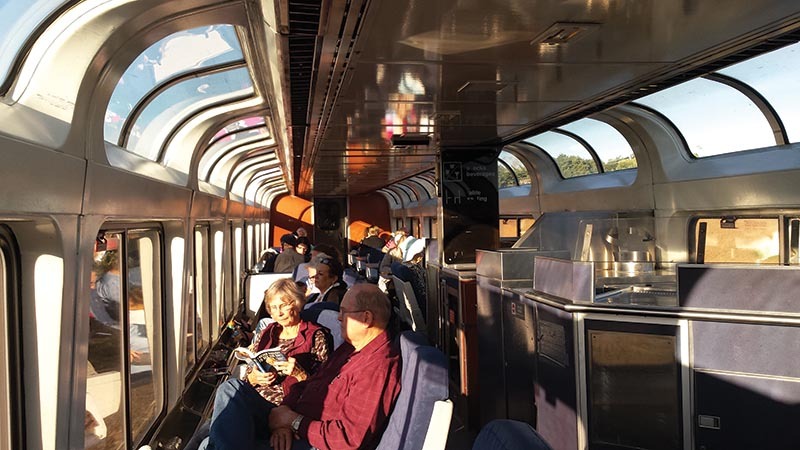 I decided taking the Lake Shore Limited to connect with the Southwest Chief was the way to go. The Chief would be my first experience riding on Amtrak Superliner equipment, which was a statement that befuddled many of my colleagues. Sorry, I grew up in the northeast, where we only have Amfleet equipment. My overnight trip to Chicago was uneventful, arriving a few minutes ahead of the 9:45 a.m. advertised schedule. I had a few hours to kill before my 3:00 p.m. departure of the Southwest Chief, so I decided to do a little sightseeing. But first, I checked in to the new Legacy Club just off the Great Hall in Chicago’s Union Station. Admission to the Club is just $20, which gives you access to the lounge with spotless restrooms, comfortable chairs, TVs, wi-fi, chargers, snacks, and soft drinks. More importantly, I had a safe place to stow my bags while I was out enjoying some fresh air. Upon returning to the Legacy Club, I discovered there was a complimentary Friday Happy Hour, so I enjoyed a beer while I checked my email and charged my phone. When it was time to board, we were led to the gate so that we could get on before the regular coach passengers. The Legacy Club was worth every penny. Did I mention this was my first ride on Superliner equipment? I was very excited to climb those narrow stairs to my comfortable coach seat (which I dare say has even more legroom than the already roomy Amfleet). We departed right on time, and immediately I felt the difference in ride quality. It was definitely a different sensation to be riding up so high above the railhead. By far, my favorite part of the train was the Sightseer Lounge with the wraparound windows. The dense Chicago suburbs along the old Burlington “Raceway” soon gave way to rural small towns along the old Santa Fe line. Sunset came as we crossed the Mississippi River at Fort Madison, Iowa. I made a 6:30 dinner reservation and joined an interesting couple from Lawrence, Kan., and a lady traveling to Kansas City. Pleasant conversation was paired with a nice glass of wine and good food served at track speed. Arrival into Kansas City Union Station was again a few minutes early. The only real disappointment was the long trek around the side of the building on a steel gangway that leads to a side door for the walk through the main concourse to the front entrance. Since the original passenger concourse is long gone, this is the only way in and out of KCUS. A Saturday chase with Steve Barry of Union Pacific’s No. 844 under leaden skies was punctuated by the WRP company gathering. It was great to meet with all of our colleagues from around the country as well as our friends in the “home office.” Books editor Chris Lane joined Steve and me for a “victory lap” on the new Kansas City Streetcar after the party broke up. The early morning Chief departure from Kansas City allowed for the run to Chicago to be completely in daylight. I spent a lot of time in the lounge car soaking up the essence of Santa Fe mainline railroading while answering email and drinking my morning coffee. The more unusual trip came this past November when I traveled to Milwaukee to attend the annual Trainfest train show. Once again I boarded the Lake Shore Limited for another easy trip to Chicago. 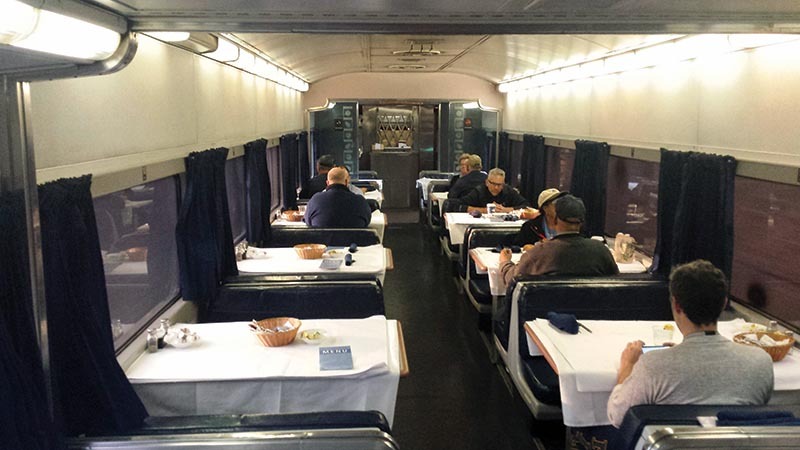 The only letdown was the introduction of “Diner Lite” services, as many of the Heritage Diners have been pulled from service and the new Viewliner replacements are not yet available. The temporary solution is to add another Amcafe and offer a menu with slightly reduced selection. It’s not too bad if you close your eyes and pretend your food didn’t come out of a microwave. On a positive note, I ran into Mike Schafer, editor of Passenger Train Journal. He was returning from an impromptu trip to Utica, N.Y., to document the Adirondack Scenic Railroad cleanup train bringing in all equipment and materials from Lake Placid (see page 14). We enjoyed conversation over coffee, and then parted ways (Mike would be joining us for the show later that evening). As we departed South Bend, Ind., I placed a phone call to marketing director George Riley, who was driving up from his office in Virginia to meet me in Milwaukee. The Lake Shore was running on schedule, so I was pretty sure I was going to make Train 333, the 10:30 a.m. Hiawatha Service departure. It was a beautiful fall day with clear skies, so I asked George if he didn’t mind diverting off the path a bit to pick me up in Sturtevant, Wis., so we could go check out the nearby Kenosha Trolley. We enjoyed lunch at Culver’s followed by a ride on classic PCC trolley cars. After a successful Trainfest weekend, George and I made plans to drive back to his office in Virginia together so we could bring back some show materials and displays. I volunteered to pilot our rented box truck all the way from Milwaukee to Lynchburg, Va. After a day to recover and gather my wits, George put me on the early morning departure of Train 20, the northbound Southern Crescent to New York City. Kemper Street Station is an old Southern Railway facility that was restored by the city government in 2000. The current Amtrak waiting room occupies the old freight section at track level. The Crescent arrived just a few minutes late in the pre-dawn hours, with heavy fog permeating the air. As dawn broke, I noticed frost on the kudzu as we sped north. 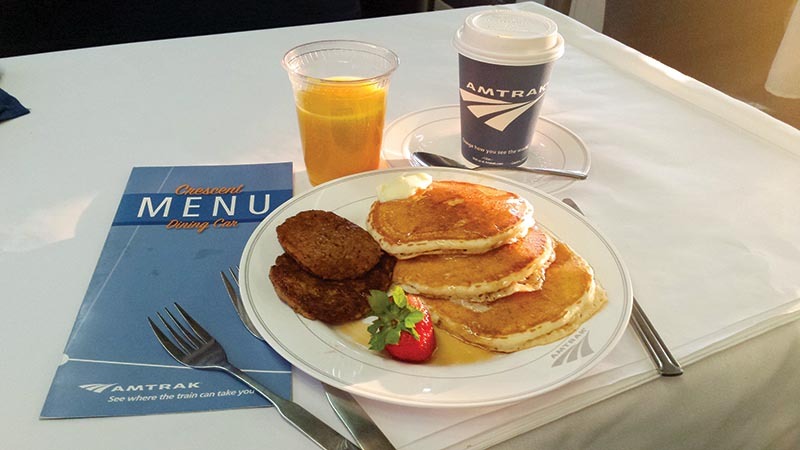 Around 7:30 I made my way to the diner car (Amtrak 8509, ex-Northern Pacific 459) and enjoyed pancakes, juice, and coffee for my breakfast. I relished what could be my last ride in a heritage diner before the replacements arrive. Small towns gave way to the suburbs served by Virginia Railway Express. Upon arrival at Washington Union Station, I hopped off to snap a photo of Norfolk Southern business car Maryland that had tagged along for the ride. Once our diesels were swapped for electrics, we were again on our way. It was fun to see the colorful commuter trains of MARC at Baltimore and SEPTA in Philadelphia. Once I spied NJ Transit trains as we arrived in Trenton, N.J., I knew we were getting close to New York. Familiar stations like Princeton Junction, New Brunswick, and Metuchen flew by in a blur. As we departed Newark, N.J., we raced a Port Authority Trans-Hudson rapid transit train across the Meadowlands. Soon we plunged into the east portal and the darkness of the Hudson River Tunnels. As we slowed for the approach to the platforms of Penn Station, it was weird to see the once familiar glimpse of the Manhattan skyline through the “air hole” to now be covered over by the new Hudson Yards development. It had been at least ten years or more since I boarded the Lake Shore Limited (or any train) at New York Penn Station. I had about an hour and a half to kill, so I took a quick walk up to 34th Street for some fresh air. Then I ducked back into the station for a quick lunch of thin-crust pizza followed by a visit to a deli to grab a sandwich for the ride home (declining the option for a “Diner Lite” dinner on-board the train). 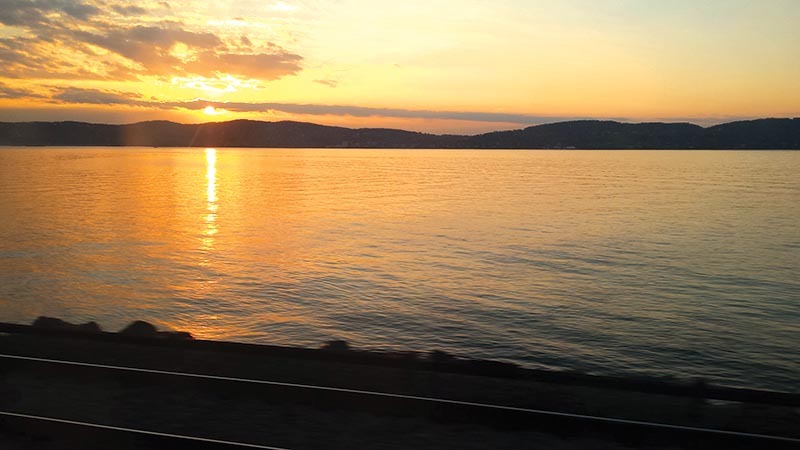 I was treated to a beautiful sunset over the New Jersey Palisades as our train sped north on Metro-North tracks along the Hudson River, but it was already getting dark by the time we arrived in Croton-Harmon station. Things sure looked different since I moved out of the area a few years ago. While the original Harmon Shop has been demolished in favor of a modern maintenance facility, the bigger shock was to see the CSX Croton West Yard to be completely devoid of any cars. Train time is what you make of it. I listened to music, answered emails, and edited the text of a feature story as we made our way to Albany. It’s been a few years since I have visited the new station, and it was great to see progress being made on longer platforms. When we arrived, the Boston section of the Lake Shore Limited was already waiting for us. While crews combined the two sections, I headed upstairs to replenish on snacks and drinks for the ride west. I was quite pleased to find the station newsstand was fully stocked with both Railfan & Railroad and Railroad Model Craftsman. Into the evening hours, the train gets quiet. Conversations die down, replaced only by the squeal of steel flanges as we skirt the shores of the Mohawk River. Alone with my thoughts, I doze off until the conductor wakes me for Rochester. Train travel is an experience like no other. Take advantage the next time you can. Don’t hesitate to fly Amtrak for your next trip. Otto M. Vondrak is associate editor of Railfan & Railroad magazine, and a frequent Amtrak rider. This editorial originally appeared in the January 2017 edition of Railfan & Railroad.